Although perhaps not when it’s 34 degrees Celsius. 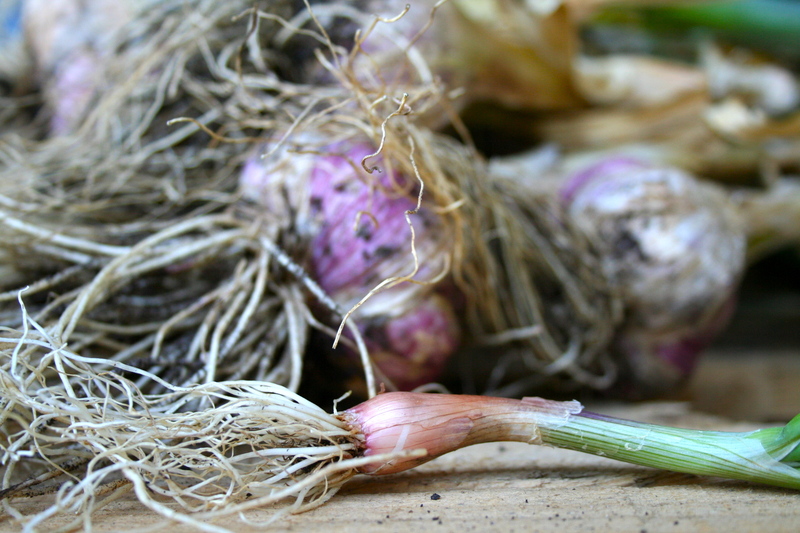 I have just come in from harvesting my first crop of garlic. It’s hot, I’m now sweaty and red-faced, but I have to say it feels pretty satisfying. In April, I prepared the garlic bed. 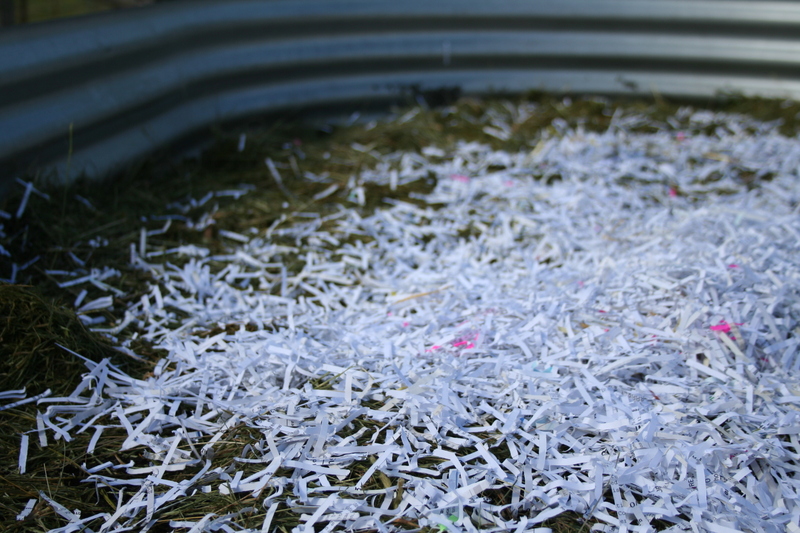 I layered straw on top of shredded paper (years of archived tax returns are finally proving to be of use) on top of grass clippings. I then created small hollows in the straw, poured in soil and planted the cloves into each pocket of soil. And most of them grew. I’d say it was a 95% success rate. I planted two head of Southern Glen and two head of Italian Red, both certified organic and both mail order from The Diggers Club. Fast forward six months, and the garlic leaves had just started to wilt, turning brown and crisp in the last week. Apparently this is the best time to pick them. 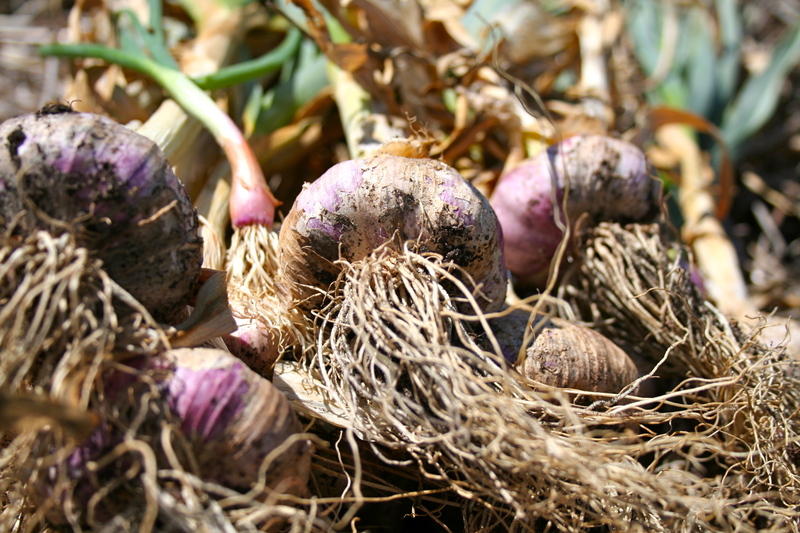 If you wait until the leaves are completely brown, the garlic cloves will likely have burst from their skins and this makes them difficult to store. Of course, you can also pick them too early and the cloves will be small and won’t store well. I think, all bar one (the largest has just started to burst through its’ enclosing), the bulbs seem pretty perfect to me. 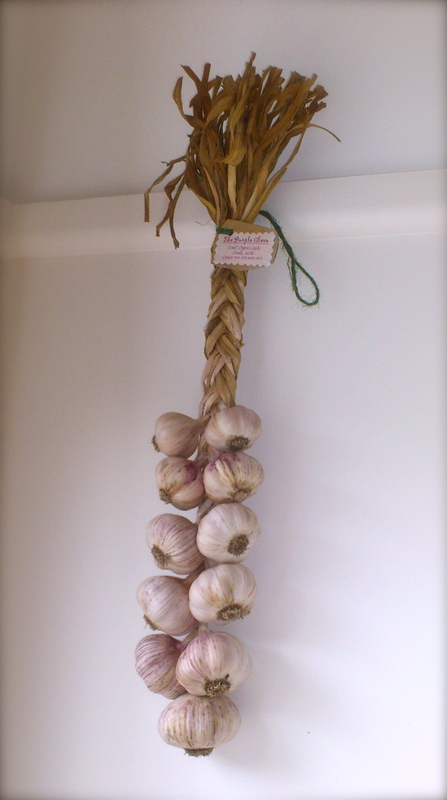 I took my spoils into our shed, tied the garlic by the leaves with hay-bailing twine, and hung it in bunches from a metal ladder that sits atop the shed rafters. There they will stay, hanging and drying for some weeks, until the leaves and outside layers are crisp. This is called ‘curing’ the garlic. Fingers crossed. Well cured garlic will last for months. Some of the bulbs are beautiful and big, others smaller but still worth drying and storing. With any luck, this lot will keep us going until next Spring when we’ll harvest our second crop. Hot on the tails of my garlic joy, I thought I’d pull up some of my onions too. And oh, what a disappointment they are! Here is one of them lying on a wooden bench being dwarfed by the garlic bulbs. It’s pathetic, absolutely pathetic. Not even the size of my thumb nail, it doesn’t even deserve to be called ‘onion’. I think I shall re-name them Spring Onions and eat them as such. So a win, and a loss. And the lesson: onions need to be watered too it turns out. Mental note for next time. Needless to say my garlic will not be going in the Show, nor have I got enough to sell. But we will chop it, roast it, fry it, slice it, crush it, and add it to all manner of dishes and relish in the knowledge that it’s locally grown, free of pesticides, herbicides and fungicides and hasn’t been washed in chlorine to make it sparkly white. Instead, it will simply bear a tin shed kind of glow. 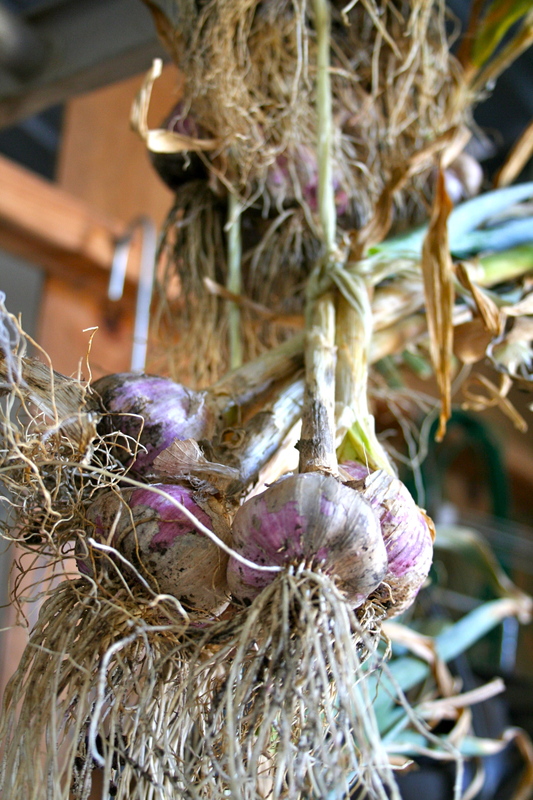 This entry was posted in Vegies, fruit and flowers and tagged drying garlic, growing garlic, harvesting garlic by Bec H. Bookmark the permalink. Wow Bec. 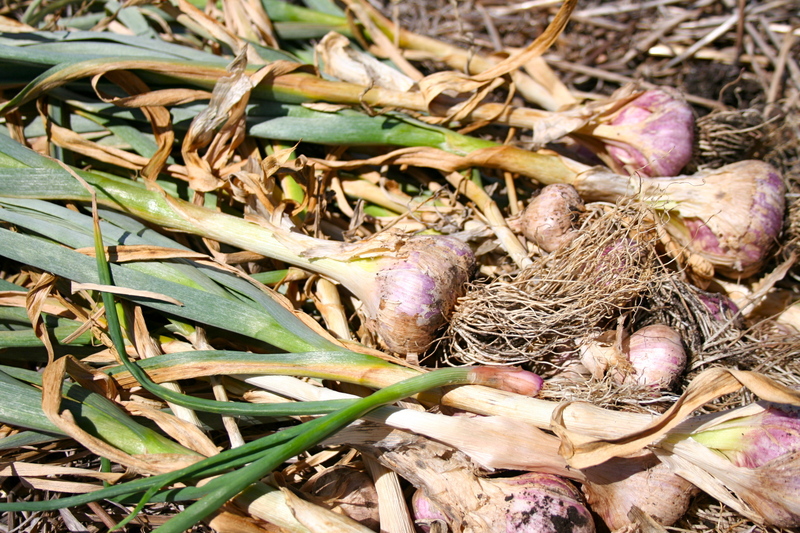 Where I ‘harvested’ (I use the term loosely) my garlic last year, it didn’t look any bigger than when I planted it. As a clove. Needless to say, I haven’t replanted (oh, that’s right. I haven’t replanted anything), and shall be looking to Kim’s stash at the markets! What am I say saying?!!!! And of course I’ll be looking to yours! Perhaps if I do all that preparation work next time my garlic will grow as well as yours Bec! WOW; what a harvest Bec! Looks so much more enticing than any I have bought in the shops!! Congratulations!! Superb photos too. Where would this blog be without comments from our respective families – thank you! 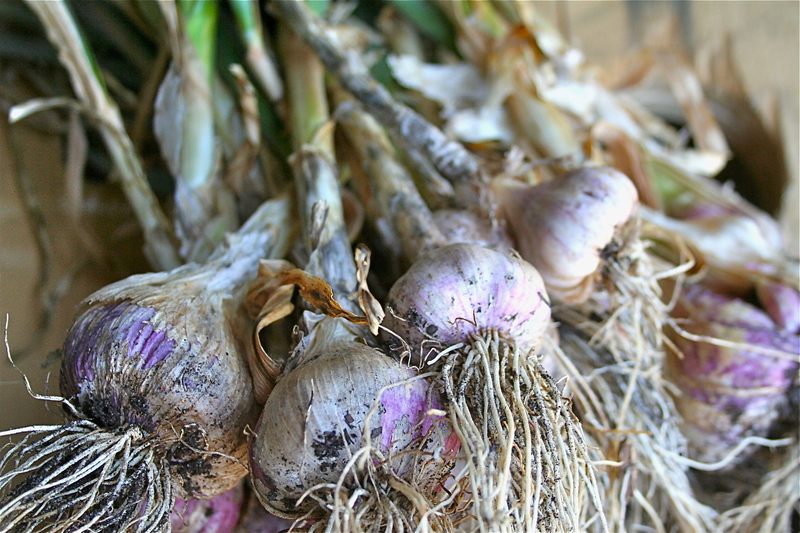 Free garlic for all of youse.